Thanks to the Daniel Boone Inn and Chetola Lodge for providing these dining experiences. All thoughts shared below are my own. Are you drooling yet? Can you believe those photos are actually what my family and I consumed during our weekend trip to the mountains recently? Every bite was fantastic and usually followed by a, "wow". 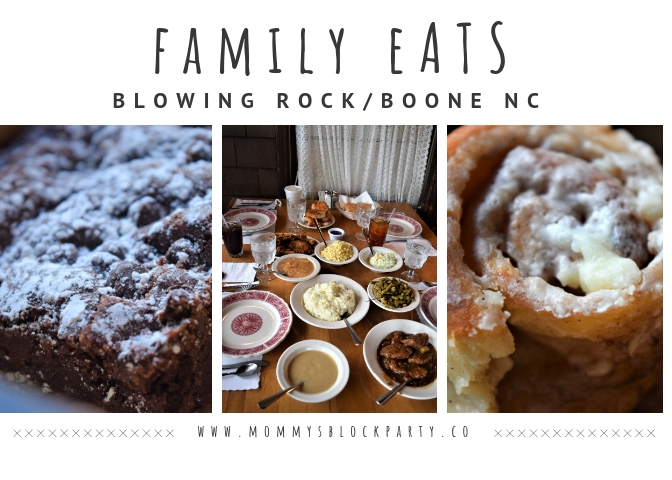 Stick around for a few minutes and read about three amazing, family-friendly dining experiences in Blowing Rock and Boone! The Dan'l Boone Inn is a restaurant that has been around for 50 years, serving home-style meals reminiscent of your grandmother's cooking. This was our first time experiencing this restaurant and I can say with assurance, it will not be our last. Before you even enter the restaurant, there are plenty of neat things to see and read as you learn more about the history of the restaurant. 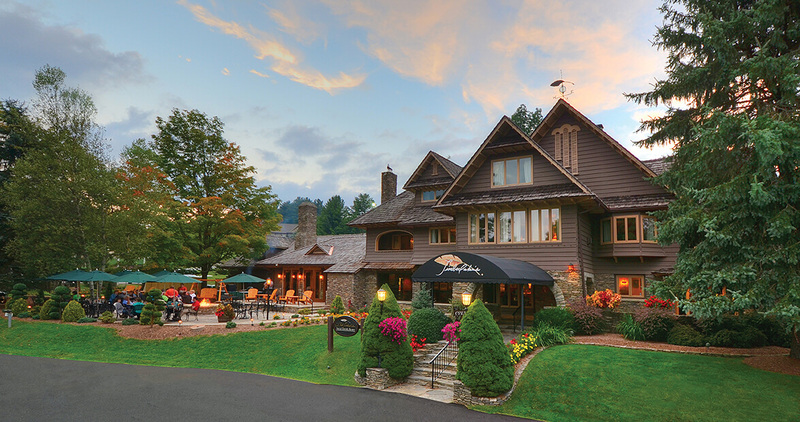 The Dan'l Boone Inn is an all-you-can-eat restaurant. The table pictured above is after our waitress delivered everything we would need for our meal. The food is AMAZING. 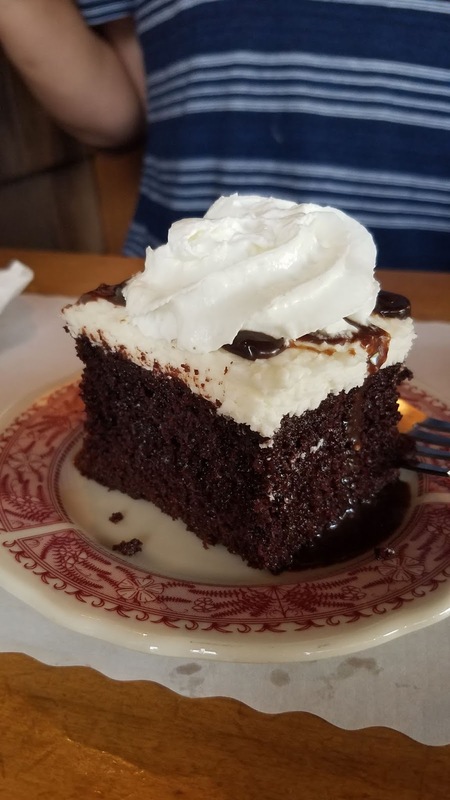 If you like classic, traditional recipes that remind you of your grandmother's cooking, you have got to try the Dan'l Boone Inn! Yes, there is dessert too and I can honestly say my kids, husband and myself agreed the chocolate cake with white icing knocked our socks off. There is so much history to take in as you enter the restaurant. My littlest guy was fascinated by all of the different shapes and sizes of the guns in the cabinet. The next stop during our amazing weekend in Blowing Rock and Boone was The Chetola Lodge breakfast buffet. I'm pretty sure we are all mourning the absence of these restaurants in our lives since returning home. The Chetola Lodge is a beautiful, picturesque mountain resort that sits on a stunning lake. It is absolutely no wonder this location hosts many weddings every year. The breakfast buffet offers classic items you would expect and a few special items that may surprise you. For instance, the day we dined there a greek hash brown casserole was being served! There are delictible cinnamon scones, eggs, pancakes, bacon, sausage, bagels, fruit and so much more. Bring your appetite with you! The last stop that I simply MUST share with you was a last-minute discovery. I discovered cinnamon buns that killed all other cinnamon buns for me. The Backstreet Bakery is located in downtown Blowing Rock, NC. The streets are quaint and lined with special shops and delicious smells. Down a flight of steps and around the back of a building you will find the most delicious cinnamon buns! They are practically hiding, but when you make the discovery, you will NEVER forget them. These yeast cinnamon rolls are absolutely life changing. That probably sounds like an exaggeration and maybe it is, but my mind was truly blown! The owner is just as sweet as her bakery concoctions and I enjoyed talking with her about our dogs while I perused the decadent options. Another favorite from the bakery were the macaroons. They were perfectly crisp, yet tender and the cream filling was perfect. I happen to LOVE macaroons and was really excited to see she had them available. She let us have one for free as a sample! If you've been able to read this far without going to get a snack, kudos to you! Reminiscing about the amazing foods we ate during our weekend in the mountains has me itching to return! Let me know in the comments section if you have enjoyed any of these establishments. If you haven't, you will definitely want to visit all three of these food establishments the next time you visit the mountains of North Carolina. 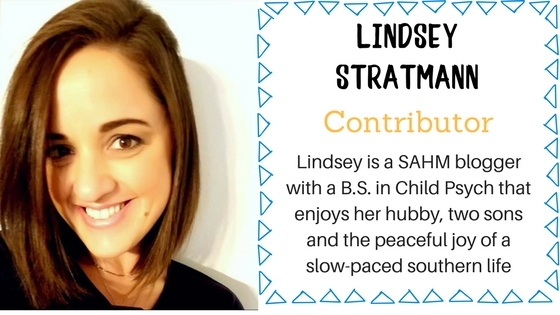 Lindsey Lou's Final Thoughts: Bring your appetite to Dan'l Boone. The food is delicious and the atmosphere is interesting! You should experience the breakfast buffet at Chetola Lodge for two reasons: the food is FIRE (aka amazing) and it comes with a view to match. Indulge your sweet tooth at Backstreet Bakery and you'll be thanking me later! Would it be concerning if I drove an hour and a half just to get cinnamon buns?